That is a big number. One that we all strive for. What does it mean? 5 years is great. But I want more. It was on September 29, 2010 that I was diagnosed with breast cancer. On that day my life completely changed but I can honestly say that the last 5 years have been my best years yet. At that point 5 years ago, I felt my life was directionless and at age 27, I was struggling to find my path. In the days after my diagnosis, I made a pledge to myself. I promised that I would not let cancer take anything away from me, but that instead, I would take everything I could from cancer. I'm happy to report that I have kept this pledge. I changed my job and lowered my stress. I am in the process of evolving my career and started grad school to get my MSW. I have gotten involved with some incredible cancer support organizations (Smith Center for Healing and the Arts, Young Survival Coalition, Ulman Cancer Fund). I've met countless, inspiring young survivors. I've made incredible friends who continue to inspire me and lost others long before I should have. I learned how to run and have completed numerous 5k's and a 10k. 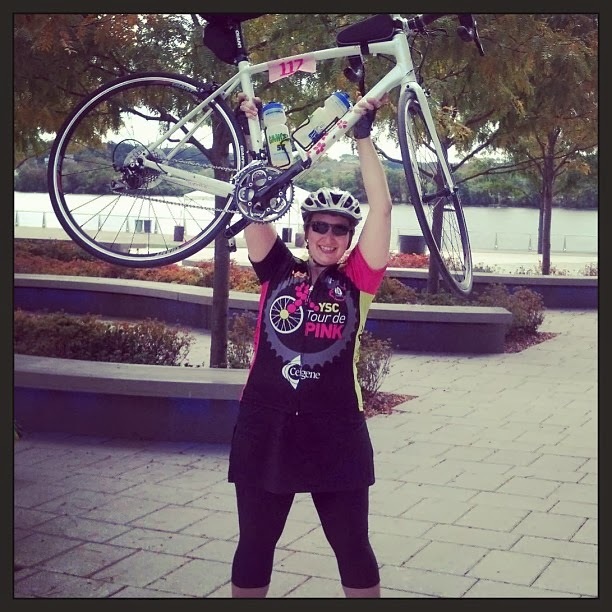 I re-learned how to ride a bike and completed the 3 day bike ride Tour de Pink. I married my best friend (love you Ben!) and discovered a beautiful new place (Palisade, CO) and a supportive pink family in The Wedding Pink (Thanks Cheryl). I trained as an Integrative Patient Navigator and serve as a survivor mentor through a couple of organizations. I have sat with and listened to many other young women and men diagnosed with cancer much too young; I've shared my experiences and tried to learn from theirs. I have attended conferences and trainings and visited so many new places as a result (Denver, Houston, San Diego, Seattle, Nashville, Indianapolis, Chicago...). I graduated from Project LEAD and became a trained patient advocate serving on DOD research review panels and am a member of the Georgetown Breast Cancer Advocates. I've become a calmer and more even-keeled person. I'm trying to be a healthier person and that is an ongoing process. I strive to keep learning, keep growing and keep sharing. I try to always count my blessing. Thank you to my amazing family who has been with me through these 5 years (thanks Mom!). This is not meant to be a laundry list of accomplishments or accolades. This list is simply the evidence to show that I've kept my pledge and that I'm still working on the greatest accomplishment yet: I'm LIVING. Not just breathing and existing, but truly living life and enjoying it. Here's to five years down and fifty+ to go! I just realized its been over a year since I last posted here and what an eventful year it has been. First of all, check out how long my hair is now!! I started a new job working at a DC cancer support non-profit, Smith Center for Healing and the Arts. I love working here. The environment is so healthy and relaxing -- my stress level has been reduced greatly and I feel healthier. I also participated in a program called Cancer to 5k in the spring and successfully trained to run my first 5k in early June. I ran the Komen Race for the Cure 5k (ran the whole thing, no walking) on a Saturday and then turned around to run a second 5k (the CT5K goal race) on Sunday. I even beat my time from Saturday! 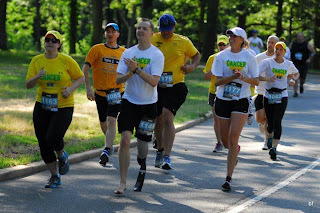 I began training in August to run a 10k (a rather daunting goal, but we'll see how it goes). My goal race is on November 11 in DC, so I'll report back on what happens. I'm not going for speed, I just want to complete the race. I traveled to New Orleans (in February) for the Annual Conference for Young Women Affected by Breast Cancer. What a great experience. Not only did I get to experience an fascinating city (once I left Bourbon St) and amazing food, but I also got to meet some wonderful young women who encouraged and inspired me with their stories. In June I got to travel to New Hampshire to attend the wedding of two of my favorite people, Katie and Kent and got to experience just how beautiful and serene NH is. Ben and I had an amazing time with friends and can't wait to find an excuse to go back. This weekend, I will head to Nashville to participate in the Women Rock for the Cure retreat. Its a weekend of wellness and bonding for young women breast cancer survivors and I get to attend with another one of my favorite survivors, Tara. On a less than happy note, there were a few "setbacks" to my amazing year. There have been a few of my fellow young survivor friends that have had reoccurrence and are now dealing with treatment for a second time. While I can only begin to imagine what they are feeling and going through, its definitely unsettling when you face the fact that even though you gave your all to battle this disease, there is always the possibility that you'll have to do it again. The thought is always in the back of your head, but once you have close friends facing it, the fears and possibility becomes much more real. The most notable "setback" was my father's diagnosis of pancreatic cancer in early July. It came out of nowhere and everything happened so quickly. We watched his strength and health deteriorate (with the help of chemo) over a 4 week period and he passed away on August 2, 2012. I felt like I was facing his death with mixed emotions. 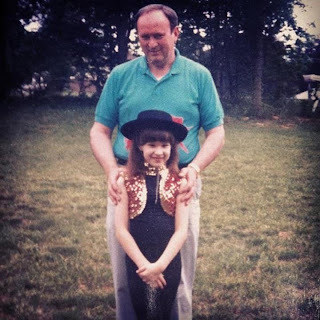 On one hand I was obviously saddened and devastated by the fact that I would no longer have my father in my life, but on the other hand, I was so relieved to know that he wouldn't be suffering in pain any longer. Those last 4 weeks were not the most comfortable ones for him and I hated to see him so helpless - a feeling which I knew he hated to experience. And while the whole experience was not one I enjoyed, I did feel like I was stronger and better able to handle the hardships and grief because of what I had gone through with my breast cancer. I had already been severely tested and I knew that I was strong, so I just had to keep my wits about me and rely on Ben, my friends and my family when I needed strength and support. Maybe a week later, they contacted me again and said they wanted to interview Ben and I. According to their website, they were going to interview all of the finalists before making a final decision, so I knew not to celebrate yet. But again, I thought we had a really good shot at winner. I'm confident Ben didn't think we had a chance. About a week after that, I received a call from Cheryl while driving home with Ben. I put it on speakerphone and she announced that we had been selected as the 2013 recipients of The Wedding Pink. Then came the processing. Ben and I had just won a huge $35,000 wedding. 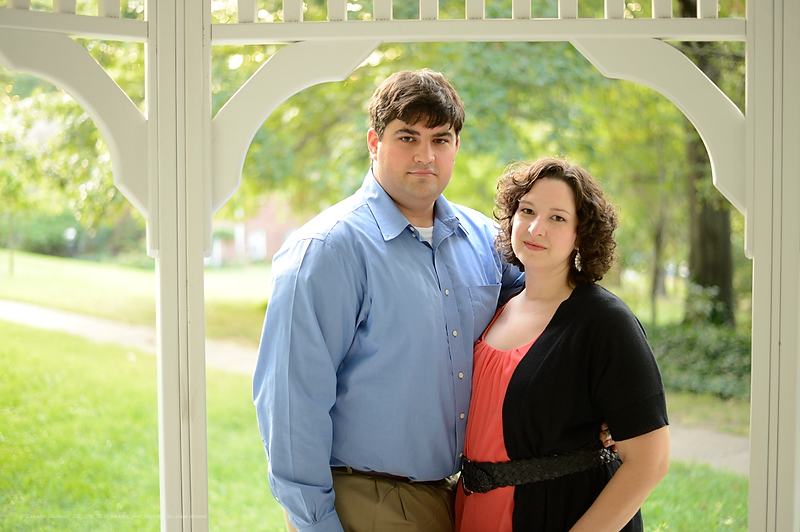 Sure, we had been talking about getting married, but no concrete plans had been set and we weren't officially engaged. We both had to take a little time to get over the shock of winning and get used to the idea that not only were we going to get married, but that we also already had a date set (just 9 months away) and most of the details were set. After about a week of digesting, we settled into yet another "new normal" and we began to announce the good news. Everyone was completely shocked (as were we) but we've received nothing but love and support from all of our family and friends. I guess once you are with someone for 7 years and you go through all the things we've been through, no one is going to try and talk to you out of getting married. Once we found out that we had won, I immediately went into planning mode. Of course. I've renewed my love of pinterest and I'm sure all of my followers are sick of me posting wedding and dress ideas, but get used to it! We've started preliminary planning with Cheryl and our wedding planner, Chelsea Lorean of Chelsea Allie Wedding Planning and Design. We also had a quick photo shoot with an amazing DC based photographer, Cameron Davidson so that they could get photos for the website. We are flying out to Colorado in early October to start planning in person and to meet all of our amazing vendors who are donating their services. I'll get to start dress shopping soon and begin putting together the most amazing party Colorado (or DC) has ever seen! ;) I'll share more on our adventures of planning for The Wedding Pink over the next few months. And while I'm not one who would usually think this, I do feel like my father might have had a hand in me winning this contest. He loved the mountains (CO) and he loved me and wanted the best of everything for me. And while I get emotional at the thought of him not being there to walk me down the aisle and dance with me, I'm so excited to be a part of this wedding because I feel like he would have loved everything about it. Bottom line: I can't wait for the rest of 2012! We are going on a cruise at the end of November (yay!) and I'm turning the big 3-0 (yikes!!!!) at the end of December. And now I know that 2013 (the year-long celebration of my 30th year of life) will be amazing as well. It has been quite awhile since I last wrote on here, but its been an eventful summer. I've been staying busy with work, travel, weddings, dinners, ballroom dance class, pottery class, earthquakes and just life in general. Which is fantastic. I've been feeling normal and well and I've got at least an inch of thick hair growing in. Its almost like I can pretend the past year never happened. Almost. There are still a few tell tale signs, but for the most part my daily life doesn't suggest that any of this ever happened. And I really have mixed feelings about that. I can walk down the street and no one would know what I've been through this year. You could look at me, talk to me and never know. On one hand, when I was going through chemo and bald and tired all the time, I craved normalcy. There was nothing I wanted more than to feel "normal" again -- thats the best and most effective way to describe it. I wanted nothing more than to have this all behind me. Now that its behind me and the events of the last year are starting to get fuzzy and blur together, I'm trying hard to remember. Yes, I'm grateful to feel like myself again, but the truth is this whole ordeal is a huge part of who I am now. I've gained a lot of patience and strength from the experience and I don't want to lose any of that. I don't want to forget what I went through and I don't want to take any of it for granted. So now I struggle with walking the line of moving forward, but holding on to at least a piece of what I've been through. And I'm not quite done yet. Two weeks from today I will have my (hopefully final) surgery to finish up my reconstruction. I'm very eager to get it done and truly be able to have the major stuff behind me. Once I'm done with surgery, the only piece of treatment I have left is my Tamoxifen - which is a pill I will be taking every day for the next 5 years (technically 4 years, 8 months now). Tamoxifen is not the worst thing ever (especially when you compare it to chemo), but its not exactly a barrel of laughs either. The biggest side effect is hot flashes -- which I experience multiple times every day. They are definitely manageable, but annoying. And it does interrupt my sleep, as I wake up throughout the night too hot or too cold, but I think I've gotten used to that for the most part. But back to surgery, on September 7 at 9am, I'll start what will hopefully be my last surgical procedure for a long time. Can't wait! The other interesting aspect to my lift right now is that I'm starting to experience all of my 1 year "cancer-versaries". July 4th weekend was the 1 year of when I first found the lump and all through August/September, I was getting tests done. September 29 will mark 1 year since I was diagnosed and October will be when my Pink Aversion (and this blog) first began. October will definitely be more meaningful this year and I'll be able to tolerate Breast Cancer Awareness Month much better than I could last year. October is will also be the 1 year from when I started chemo. I'm a little nervous that the cold, crisp fall air is going to make me think of chemo, but I'm planning to keep myself very busy and distracted just incase. Regardless, this year is going to be about a lot of reflecting and a lot of celebrating, so I hope you will all plan on joining me as I commemorate all of my 1 year "cancer-versaries" this year. I'm going to try and post a little more regularly to this thing and I hope to have some photos up soon too, so you can see more of my hair "evolution". Its been one week since surgery and I feel pretty good. Overall, I have to say that surgery was much easier than I expected it to be. I never really felt like complete crap afterward and with the exception of being tired or being sore, I've felt great from the start of recovery. Once again, this whole experience has been defined by the notion that nothing is as bad as what I anticipate before hand -- which is great! After my surgery on St. Patrick's Day, I spent the night in the hospital and was discharged the following day around noon. Since then, I've been quietly recovering at home and going to follow-up doctor's appointments. The drugs they gave me really made me feel great (but sleepy) for the first few days. I'm not on quite as much now, but I am holding on to the pain medication. :o) I still have tubes sticking out of me, which are highly annoying. They are there to drain excess fluid from the surgical site, but I'm very ready to have them gone. I'm pretty sure I'll be able to have one removed tomorrow, but I fear I may be living with the other one for a few more days. As I've been sitting at home, I've been catching up on my day time television. I'm really enjoying the home improvement and landscaping shows and I've also just discovered this very entertaining blog: http://www.younghouselove.com/about-2/. Perhaps some DIY projects are in my future. I've also seen substantial hair growth over the last couple weeks. Its still very early, but I hope to have enough to have a real head covering do in the next month. I'm crossing my fingers anyway. I mentioned earlier that I've been going to doctors appointments while I'm recovering. Yesterday I went to see my oncologist for the first time since I finished chemo. She had the results of my pathology report from the surgery and then news was very surprising. I knew at the time of my surgery that my lymph nodes initially came back clear (only 2 were removed), but they did further testing afterward. It turns out that my lymph nodes are completely clear and that my tumor was mostly DCIS (pre-cancerous cells) and just little specks of invasive cancer, which is fantastic. Now because of these two findings and the fact that I had a mastectomy and removed all of my breast tissue, I found out that I no longer need to have radiation. I'm so happy that I can cut that phase of treatment out of my plan and start moving toward the end. This means I can have my reconstruction completed sooner and most importantly, can start making plans for the next few months since I know I won't have to work around a daily radiation schedule. So once Ben is finished with tax season we might actually be able to take a trip somewhere or take a long weekend, something we haven't been able to do since last summer. I also received my prescription for Tamoxifen, which is the final stage of my treatment. Its a pill that I will take for up to 5 years and it is used to block estrogen and prevent estrogen positive cancer cells from growing. It does have some side effects, like hot flashes, but I'm hoping for the best. It's weird to think that with the exception of taking a pill and some additional cosmetic reconstruction, my treatment is essentially over, especially when I was prepared for more. But even though I'm coming to the end of my active treatment, I'm still not ready to be done with the cause. I'm still looking to connect with others who are going through this and to help anyone diagnosed in the future. I a lot left to contribute. So as a capstone to my initial fight and as a stepping off point for the next phase, I'm planning to participate in the 2011 Susan G. Komen Global Race for the Cure. Since I'm still recovering from treatment, I'm only planning to participate in the 5k walk, but I'm hoping to enlist everyone who has supported me over the last few months to join me. If you can't join but would like to contribute to our team, then of course I welcome that support as well. I hope that we can turn this day into a celebration to mark the end of my treatment and walk together for a great cause. I'm now 4 weeks out from my last chemo treatment and I'm feeling good. I think my hair is finally starting to grow again, though its hard to tell because I still have some stubble on my head from before. While I'm fine with the whole being bald thing, I am ready to have hair again -- I miss it. I finally got to schedule my surgery (left mastectomy) and its slated for March 17 (St. Patrick's Day). I guess this year I'll be getting green jello instead of green beer. I'll be glad to get the whole thing over with so I can move on to the next step. Other than preparing for surgery, I've been feeling pretty good over the last few weeks. It is so so good to feel like myself again -- I only hope I can bounce back from surgery quickly so I can go back to feeling good. I'm done with chemo. Done! Done! Done! Done! Done! As many of you know, my last chemo treatment was on Thursday, February 3. Finally, I'm starting to feel like myself again (I'd say I'm currently at about 65-70%) and each day I'm feeling better and getting stronger. Today was a big day for me and I just realized how many positive things have happened over the last week or two that have helped to bring me to my current outlook. As of today, I feel like I have a renewed sense of purpose. I feel excited about things again. And I feel like the first chapter of breast cancer is coming to a close. Sure, I know I'm not done yet, there is still quite a bit to do, but I feel like the hardest part is over and I can handle the next phase much better. Things are starting to come together and everything now feels like its happening for a reason. A couple weeks ago, I was stressing out about my surgery options. I felt sure that I was going to have to have a mastectomy due to the size of my tumor and I just couldn't get comfortable with the idea. But after meeting with another surgeon (and having almost completed chemo) I found out that my tumor has shrunken significantly and that a lumpectomy may now be an option. My tumor was initially about 9cm large and is now estimated to be about 5cm. This made me feel so much better. I can always go back and have a mastectomy later if I want, but for now, I'm way more comfortable with the less invasive procedure. I'm still waiting to confirm with my primary surgeon, but I feel good about it. Throughout this whole thing, I've been on a quest to find another twenty-something going through what I'm going through. I knew they existed and I'd heard and read about them, but I needed to meet someone to prove to myself that I wasn't alone. But all I had found were women who had breast cancer when they were in their late twenties but now its 5, 10, 20 years later and women who are in their mid thirties- to mid forties who currently have breast cancer. All of these women have been wonderful and great resources, but I still felt like there was something missing. But last week I met a 29 year old going through chemo and last night I met another 28 year old who was just diagnosed. And now I feel a sense of victory. I'm sorry that these women have to deal with this, but it feels good to see another way too-young face whose doing the same thing I am (I say "way too young" because most of the women I've met I think are too young to be dealing with this). Finally, as I've mentioned in this blog before, my goal from the beginning of this was to take something away from this whole experience -- to get something good out of it and be able to contribute something back. I do not want this experience to be a waste. Until recently, I was only able to deal with getting through chemo and just making it through everyday, that I wasn't able to see beyond that first hill. But now that I'm over the first hump, I feel like things are starting to fall into place and my purpose is starting to reveal itself. I'm also starting to feel like my old self again. Not who I was 6 months ago, but who I was 2, 3, 5 years ago. This sounds corny, but I feel a new fire in me and the passion and drive I have been lacking for awhile. And it all seems so easy ... things are starting to fall into my lap and make sense and the path just seems so clear that I would be blind if I didn't just follow it. Today I was encouraged to start a young women's breast cancer group and for any of you who know me well, this is something that is right up my alley. I've gone to a couple of young women with breast cancer support groups, but they are for women under 40 or 45 and dominated mostly by women in their mid-thirties to mid-forties. These groups are great -- they meet once a month, are facilitated by a counselor and give everyone a chance to air their concerns, talk about their feelings and ask question. What I haven't found is a young women with breast cancer social group. Arlington, Alexandria and DC are filled with young professionals and more and more young women are being diagnosed with breast cancer. When you have breast cancer, you don't want to dwell on it all the time, you want to take the moments when you feel good and have fun -- live life. I have a lot of resources now at my disposal and I think there could be a growing group of women who would be interested in getting together and hanging out with other women like them and doing something fun. Something not related to cancer. This is my new project. And I'm excited. I want to get started immediately. I just keep thinking in my head "I'm baaaack!" and it feels so good to feel like this again. I realize this whole post may sound extremely corny, cheesy and lame but I'm not sure I really care. I also have to say that I'm extremely excited about my end of chemo celebration next Friday (2/19) and I cannot wait to see everyone there. I think I should be back up to at least 95% by then, so be ready to party. I also want to take lots of pictures to document the night, my post-chemo self and my perfectly-shaped for scarf wearing head, so plan to bring your cameras. And if you hear of any young women (or anyone really who needs it) with breast cancer whether they are in the area or not, feel free to send them my way. I look forward to being a resource to others who have to go through this. Its been quite awhile since my last post. For the most part, I haven't been feeling quite like myself (wonder why?) and just haven't been able to work up the mental energy to blog. That seems to be the biggest side effect I've been facing over the last month and a half. I've been facing a lack of energy or desire to much of anything when I don't absolutely have to. I find that most of the time I'm a lump. It does get better the further I get away from treatments, but it never completely goes away and I always know its going to get worse again. Right now its hard to see beyond the immediate. I know that after just two more treatments (a month and a half?) I should go back to feeling more normal. But then when I am able to look past right now, all I can see is the next hurdle or two I'll have to take on. Everyone keeps telling me to take it easy on myself and relax. They keep telling me that its completely normal to be feeling all of this and that it makes perfect sense. That its fine if I don't want to do anything. And I see all of this. I comprehend it. And I don't disagree. The problem is that I know I'm capable of more. I know that my pre-chemo self had lazy and disconnected moments, but they never lasted for nearly 6 weeks at a time. In the first week and a half after treatment even simple tasks seem too much to accomplish. Its not that I lack energy most of the time, its more that I lack motivation and drive. Which brings me to another problem. I feel like I've become such a downer. I don't want to be a whiner, but I feel like all I have to talk about these days are symptoms and side effects. It doesn't make for very interesting conversation. So I've found myself talking less and less... I have few new things to say that don't involve chemo and cancer. Last week I received my 4th chemo treatment -- now I am officially more than halfway done with chemo. Its sounds huge but it still feels so immense to have to go through 2 more rounds. Once I get through the first few days it always gets easier, but when I'm actually going through those early days, it feels endless. And even though I'm getting used to it and know about what to expect, the whole thing is just getting to be so tiresome. I know I should be happy that I'm almost done with chemo, but it just feels so monotonous -- which I know sounds odd. The scary new-ness of it all has worn off and now it is just this tedious thing that I have to do, that's hard and no fun and not "exciting" anymore. Not that this was ever what I would call exciting in the positive sense of the word, but more in an uncharted territory, start of a fight way. I'm still have the positive attitude about the end result, but my resolve is just starting to wear thin regarding the day-to-day battle. This post is starting to seem more like a rant than anything else, so I'll go ahead and wrap it up. I hope everyone has a wonderful new year. I'm hoping 2011 is going to be better than 2010 turned out to be.